Properties in Barra da Tijuca average 4.6 out of 5 stars. Property 2: Smaller daily, better apart, better view! HOLIDAYS IN FRONT OF THE BEST BEACH OF RJ! 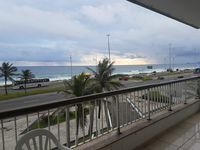 Fully furnished 2 bedroom apartment on Barra da Tijuca Beach with Wifi. Property 13: Fully furnished 2 bedroom apartment on Barra da Tijuca Beach with Wifi. PROMOTIONAL PRICES FOR THE SUMMER, IN THE BAR OF TIJUCA, RIO. Property 29: PROMOTIONAL PRICES FOR THE SUMMER, IN THE BAR OF TIJUCA, RIO. Property 34: Your getaway in Rio de Janeiro - perfect for the Olympic Games! Property 47: LINDO APTO 4 SUITES OVERLOOKING POND AND OLYMPIC PARK. Property 48: Gated community with complete infrastructure. See ratings.